WordPress is a most popular Blogging Platform ever! Its the most Powerful Blogging System and very easy to manage it. Now a days everyone want their own blog for Write Their Life Story, Post Their Photos, Publish Article About Their Research or Earn Some Extra Money. Actually now WordPress is not only a Blogging Platform, Its a Web CMS Too. Use this you can make your Personal/Business Website too, Government Website, Education Institutions Website, etc. So, I decide to I give free WordPress Installation service to people for start their 1st blog or 1st website in their web life. Coming soon Avanca WP Plus V1. 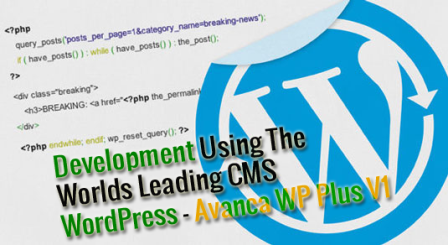 I'm glad to announce that, I'll publish Avanca WP Plus V1 in January 20. This is WordPress Version 3.8 modified version. - This is Free and Open-Source like WordPress.org version. - There is some of changed Path & Folder from WordPress Official Version. 7). Implement Theme With Ajax Load Content/Web Page to Update the Content without page Reload or Refresh. - Hide site from Google inurl search and safe your site from hacker. So here I test this on WordPress Version 3.8 and Its successfully work...if you want to try this modified version default Here I changed /wp-content/ to /umalulikappz/ and /plugins/ to /umalulikmodules/ change. Change wp-admin folder new name?? I use profile /wp-admin/ folder name changed /wp-admin/ to /umalulikprofile/ Change /wp-includes/ folder.